Call: Clare Constantine on 0400202528. Email: Clare Constantine at clarecc0@hotmail.com. 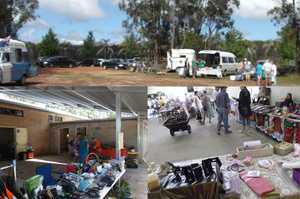 Halfway Creek Hall market is a great place to stop during a Sunday drive for delicious morning teas at budget prices and a wide variety of stalls. Check out the new murals and meet the local Rural Fire Brigade for free fire information and hose activity for the kids. New stall-holders and car-booters welcome, $5/table indoors Liz 6649 4432 or $5/stall outdoors Lois 0427 492 060. Proceeds from the Spring market will be donated to Buy a Bale farmers charity.